The situation in Toronto when it comes to housing asylum seekers and the homeless is so tight that the City of Toronto May buy a bankrupt hotel. 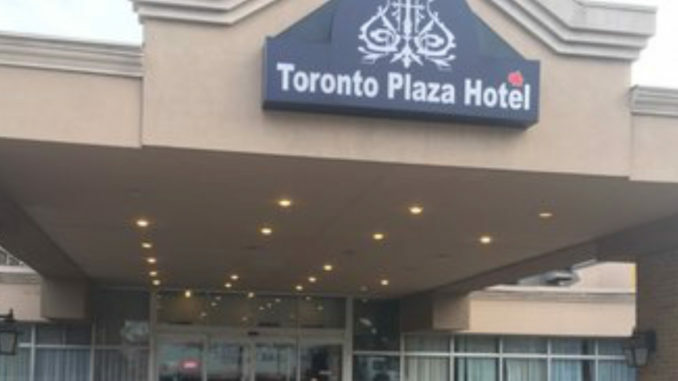 According to CBC, city officials have already made an offer for the bankrupt Toronto Plaza Hotel all in an effort to keep available beds open for shelter needs. The city has been complaining about a strain on the city’s shelter system since last summer, asking the feds to help with costs. Now things are so strained that the prospect of losing the Plaza has the city looking to make a deal. According to the report the hotel is at or near capacity most nights housing homeless families or recent asylum seekers. With the property now in receivership the city is worried a developer will step in and scoop up the 199 room, seven acre property that houses close to 500 people a night. So the city is looking to buy the property. How is that for desperate? The hotel was purchased by the present owners in 2016 for $17.5 million. No word on what the city offered but documents do show an offer has been made. The strain on the city’s shelter is obviously the result of the mass influx of asylum seekers and therefore if anyone is should be buying the hotel it is the feds. While the feds are good at lobbing accusations and calling people names on this file, they aren’t good about living up to their responsibilities. While the main provinces impacted by the illegal border crossing asylum seekers have asked the feds for hundreds of millions to pay for unforeseen costs on social services, education and other factors, the feds have balked. So far Trudeau’s government has only offered up $50 million between Quebec, Ontario and Manitoba. Recently, when Ontario cabinet minister Lisa MacLeod put out a news release calling on the feds to live up to their responsibilities, the name calling started again. Trudeau’s immigration minister, Ahmad Hussen effectively called Lisa MacLeod a liar. He also claimed she called aasylum seekers names. The name she supposedly called many of those coming across the border illegally was “economic migrants” which the federal government’s own data would support. As for her supposed lie, MacLeod said that approximately 40% of Toronto’s shelter spaces were taken up by asylum seekers. Hussen claimed that wasn’t true and that shelters don’t keep such stats. And in a rare moment of journalistic fact checking of the Trudeau government, CBC set the record straight the next day. Too bad for Hussen that people have learned to fact check him now. I’m sure that if asked about Toronto needing to buy a run down hotel to keep housing so many extra people that Hussen will say it isn’t federal responsibility and then either attack the questioner or call someone names. If true to pattern he will also claim the federal government is engaged in extensive consultations and conversations. Just don’t ask for money. Or tell them they are responsible for this mess.